The custom cell phone holder bank is attractive and cute. Such gifts certainly grab the heart of children. It makes them show it to others too. The promotional cell phone holder bank serves the purpose of building the brand recognition reminding the people about your brand in the market. It certainly caters the needs of your target market. The 2 ½” wide slots offer enough space to keep their mobile phone. 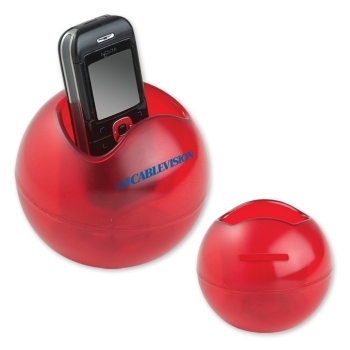 The size of this red cell phone holder bank is 4” x 3 ½”. Customized cell phone holder bank is CPSIA approved. So you can very well give these brand promotional items through schools and nurseries. They are safe and easy to handle. The removable plug beneath it helps in taking back the saved money very easily. These are fine promotional items for various business verticals. Product Size : 4" x 3 1/2"